Diffendal, Robert F., Jr., and Frank A. Smith. 1996. Geology beneath the Primary Management Systems Evaluation Area (MSEA) site southwest of Shelton, Buffalo County, Nebraska. Geological Survey Report of Investigations No. 11. Conservation and Survey Division, Institute of Agriculture and Natural Resources, University of Nebraska–Lincoln. Published February 1996 by the Conservation and Survey Division, Institute of Agriculture and Natural Resources, University of Nebraska–Lincoln. 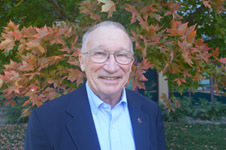 In 1990, as part of a national presidential initiative on water quality, researchers from the University of Nebraska–Lincoln (UNL) Institute of Agriculture and Natural Resources (IANR) received a multiyear grant from the U.S. Department of Agriculture, Cooperative State Research Service, to study management of irrigated corn and soybeans to minimize groundwater contamination. D. G. Watts, R. F. Spalding, and J.S. Schepers, of the IANR led a study at one of the Management Systems Evaluation Areas (MSEA). This area was made up of two sites, a primary site on a terrace of the Platte River near Shelton and a secondary site nearer the river. R. F. Diffendal, Jr., research geologist with the UNL Conservation and Survey Division (CSD) was responsible for collecting samples from and geophysically logging a series of boreholes drilled by Bob Pollack, of Pollack Well Drilling, Grand Island, Nebraska, at the primary site and for using these data to characterize the site geology. Diffendal was assisted in the sampling and logging by hydrogeologist Frank A. Smith and technician Kenneth A. Hueske, both of CSD. Raw geophysical data from the boreholes was converted to a standard format by Jerry F. Ayers, CSD research hydrogeologist. Samples and logs from the boreholes and from others drilled and logged later by other researchers were studied, analyzed, and interpreted as part of this investigation. The study site is located on a fill terrace north of the Platte River in southeastern Buffalo County, Nebraska. Thirteen test holes were drilled and geophysically logged in sections 14 and 15, T. 9 N., R. 13 W. Sediment samples were collected during the drilling of each of the holes. Fifteen cores, four to depths of 22 ft, the remainder to 19 ft, were partially recovered at other places on the site. Five of the more complete cores were studied as part of the geological characterization of the site. Descriptive logs of six of the 1947 test holes, 15 of the 1975 test holes, and one test hole drilled in 1991, as well as the records of sediments encountered during drilling of irrigation wells in the area, were also used in the study.